Oil-based cleansers and topical products are growing in popularity and certainly trending right now. Fans of cleansing oils rave about the results to the skin as well as the benefits of a cleansing/moisturizing product in one. If you ever dry your face entirely after cleansing and prior to moisturizer, you probably know that theres often a “tight” or dry sensation still leftover on the skin. This is because traditional bar soaps contain binding agents that are naturally drying to the surface of the skin. Gel cleansers vary in their formulations and properties, so some are drying while some are moisturizing. It’s safe to say those with very dry skin are still seeking a specific product or treatment to cleanse with, and are still hopeful for a deep clean. Tatcha’s Camellia Cleansing Oil promises anti-aging results and all the aforementioned benefits of an oil based cleanser in alleviating dryness with a concomitant deep clean. The Camellia Cleansing Oil acts as a makeup remover and cleanser and leaves the skin silky-soft. The company offers a wide assortment of products and cleansers, including enzyme-based powders than act as cleansers when combined with water. But the 1-step cleansing oil continues to be the most popular and raved about product for the Japenese skincare line, with a following of consumers of all skin types and ages. We found the product seems to deliver great results, holds up to the product longevity test and is suitable for a diverse demographic. It leaves skin radiant and supple, removing all makeup without drying the skin. Tatcha founder Victoria Tsai had a background in corporate work for large companies but had an underlying passion for creativity, design, and holistic approaches to beauty. After developing a skin condition she wanted to formulate a safe and effective product by sourcing only the best ingredients. She took a trip to Kyoto, Japan, and developed a “less is more” to skincare approach after studying Japanese skin philosophy. 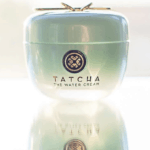 One of the oldest texts on Japanese beauty has both inspired and been the driving force behind the TATCHA brand. The company works with scientists in Japan and the U.S. to formulate safe products for modern life on the go. The company is philanthropic and funds girls’ education in as a partner of Room to Read with every skincare purchase. The company is founded on sourcing the best ingredients with the least amount of manipulation to offer a product that rates high in both safety and efficacy. Tatcha’s proprietary trio of Japanese anti-aging superfoods can’t be found in any other product or produced by any other manufacturer. It contains a blend of green tea, rice and algae and helps to restore a glowing, youthful radiance. This unique blend has not been used in any other formulation for an oil based cleanser and offers a very unique benefit to use. As with any product or brand, there are benefits to use and aspects of the product that may be seen more negatively. The strongest con we saw was in price point, it is definitely a luxury type item. But the list of positives and pros were undoubtedly longer, perhaps the strongest factor in a positive review is the trademark on product ingredients. In a highly competitive market we are overstimulated by products, brands, lines, and choices. Having a clear and quantifiable factor of differentiation with a proprietary blend certainly ears the product brownie points. Overall, Tatcha’s product offers a perfect solution to cleansing the face and removing makeup with a single product that increases hydration rather than stripping the skin. It’s great for anyone seeking a product to wash with and restore dehydrated skin. That said, it’s still suitable for varying skin types and safe for sensitive skin or skin conditions. This Japanese based company can boast proprietary formulas and subsequently deliver a unique product experience. The skin is left supple, soft, and fully cleansed. This is definitely recommended for dry skin, but remains a solid choice for anyone seeking a 2-in one makeup remover and cleanser, particularly if they would an enjoy an added benefit of hydration. Perhaps the main caveat is the price point, though we do give points for longevity with conservative use.